There is a monotangle challenge this week at I Am the Diva. The challenge is to use tipple and only tipple. As I am currently working my way through some stencils, more on that in a later post, I wanted to work on a ZIA using the idea of this week's challenge. I used my fish stencil, and not really sure what fish it is, I searched out the silhouette on google and I think that it is an Angel fish. 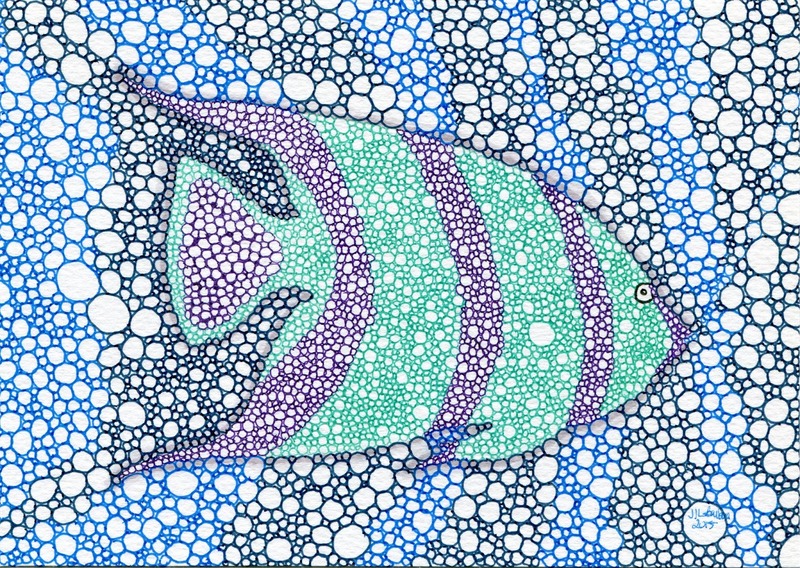 I went with the markings of a French Angel fish. 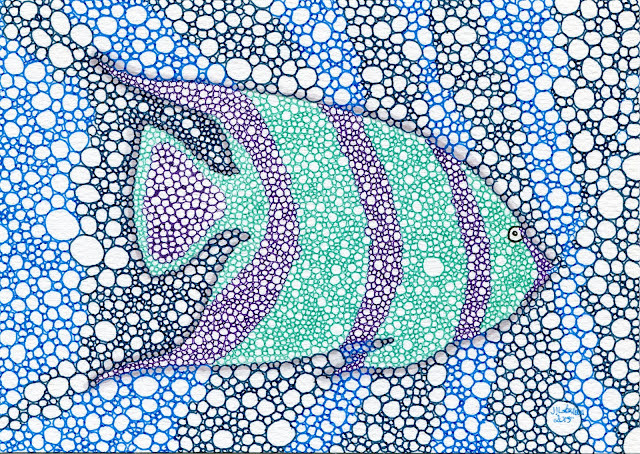 I used green and purple for the fish and blue and blue/black for the water. It may seem like a test for color blindness, but I think it works. This post is short, but kids and work await. I hope that you have a great week! Happy 4th to American readers and a belated Canada Day to my friends to the north. Thanks for stopping by! A new month, a new tangle to learn over at I Am the Diva CZT. This month the tangles is called All Boxed Up from Alice Hendon. 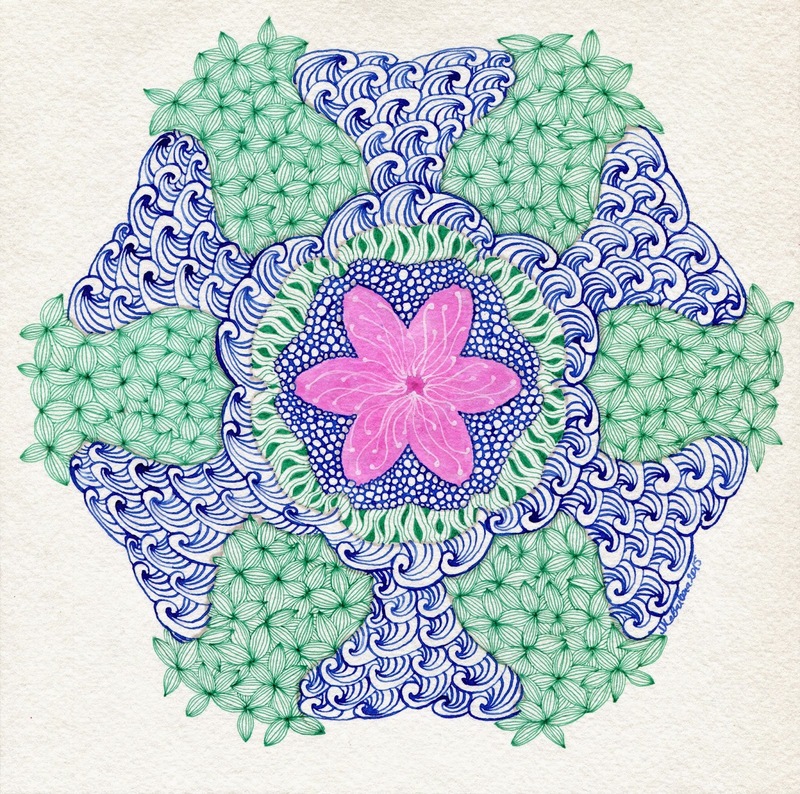 This is a fun tangle and reminds me a lot of my own pattern Zuan Shi. Alice's tangle is so simple though. There are a lot of variations possible with this and I can't wait to use it more. 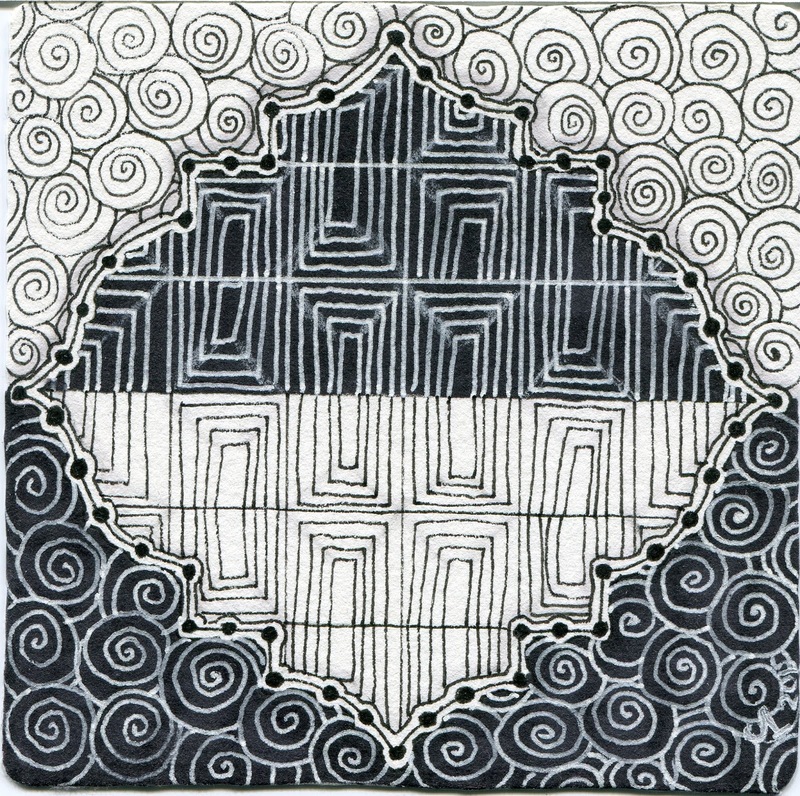 I started this tile with a stencil outline as my string. I added the dot and dash to the outline. I know it has a name but I can't think of it. While I was trying to think of what else to add, I decided to play with the idea of a mirror image. After coloring in half black, I added the All Boxed Up but managed to mess the variation that I planned on using. No matter, it just adds more interest for the tile. After that was done, I added more black and kept going with Printemps. This was a fun tile to draw. The gelly roll pen that I used for the white worked very well. Maybe it was because I was drawing over the prismacolor marker or maybe it is because it is really warm and the ink likes it warm. Whatever the reason, I was glad. I hope that you all have a great week. Thanks in advance for your wonderful comments and for stopping by. 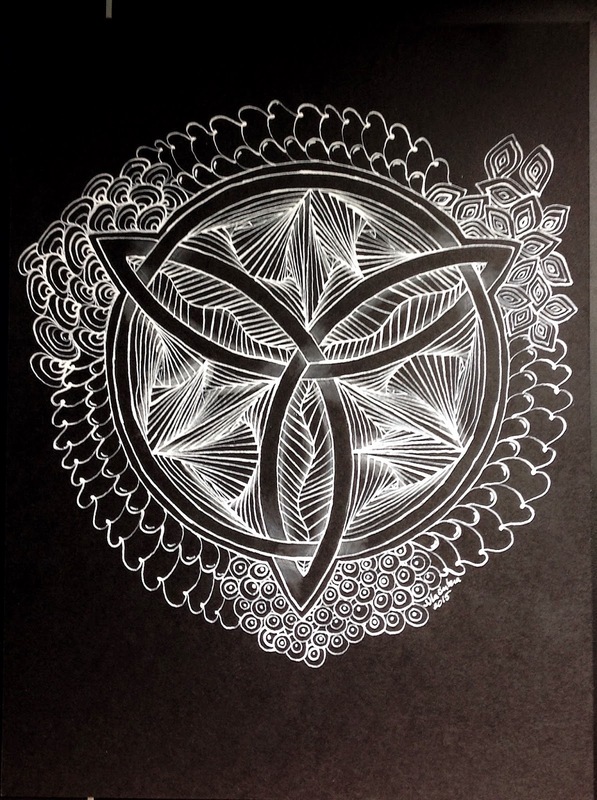 Draw in white on black is the challenge that Laura has put to us this week over at the Diva. I am not sure what happens to me when I make this simple switch but just changing the ink color can stymie my progress faster than anything else. Maybe it is just that I over think it. Who knows. This week though, I wanted to embrace the challenge. Getting things started has been difficult for me these days, so I used the challenge to do something, anything no matter how it looked. For white ink these days I have been using a dip pen and white ink from Speedball that has been thinned with some water. The ink is great but when it isn't thinned, I have to fight with it to get the ink from the pen onto the paper. I still have my white gelly roll pens but when I want to do a lot of drawing, not just some highlights, I go for the Speedball ink. My first try at this week's challenge was going well. I started with Arukas and went from there. It was when I decided to give Athitzi a try that I jumped to a new piece. I almost never just abandon a drawing, it is a rule of mine. Pushing through a drawing that I am not excited with has resulted in some of my favorite designs. Other times, a little piece that I love turns into a study for a new drawing to come. Either way, today I didn't want to push through, I wanted to try out more Athitzi right away. The pattern is so simple, yet I have not had good luck making it work the way I wanted it to. 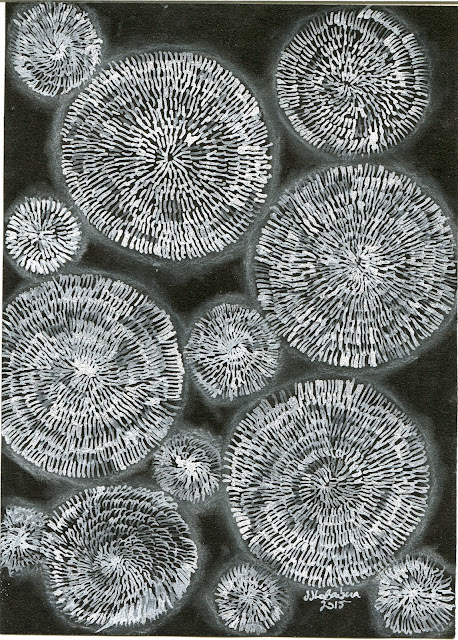 So, launching onto another 5x7" of black drawing paper, I drew some circles randomly and got started. My first circles are very controlled but I can tell when I got the hang of the pattern. I worked quicker and the lines weren't so straight any more. They get a little hook on the ends and while I do pick up my pen for each stroke, they touch and seem to be connected sometimes. The dip pen worked for me here and a against me. I like the way that the ink becomes more grey as the reserve is used up. It makes for nice variation in the strokes and even makes over lapping strokes stand out a bit more. Where it worked against me is my lazy hand. I smeared this a bit by not watching where I placed my hand. In all though, I think the smears work rather than ruin. In the end, I think it works and I am trying to decide if they look more like dandelions or fireworks. This is a zendala that I did a few weeks ago. I wanted to try a larger drawing in white and black. Sorry for the odd photo. It is too large for my scanner. I hope you all have a great week! Thanks in advance for stopping by and comments you leave. I was so excited to see this week's challenge over at The Diva. The challenge is to use a labyrinth as the string. I was excited am I have had this idea kicking around in the back of my mind but I haven't pulled it out. The challenge gave me just what I needed to pull it out. While Laura gave us instructions to draw our own, I found a layout online and traced it onto some grey paper. 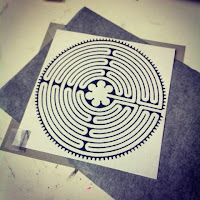 I love the look of a labyrinth, it is so graphic. But at the same time, as the designs are so often in gardens, I didn't want to go graphic but wanted it to have a more natural feel to it. I drew in brown ink for the basic out line and then used a micron to draw Betweed in the spaces. 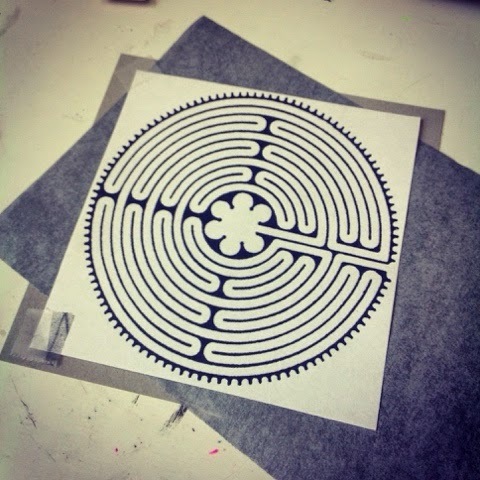 I "walked" this labyrinth several times while making this piece. First to draw it, then to draw Betweed, then to embellish the design and then finally to shade. There are some great labyrinth paths on line and I think that I will have to check them out and see what else I can come up with. Drawing my own would also be a great place to start and see what I can come up with. 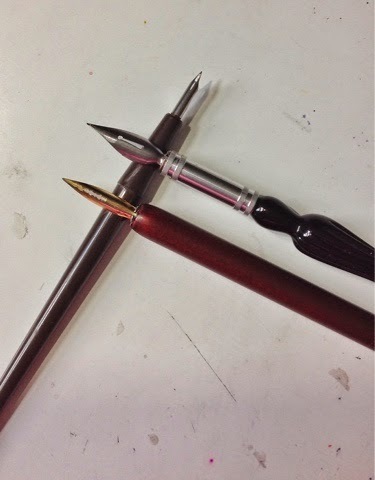 Last week Ginny Stiles asked me to show her my dip pens that I use. I was unable to figure out how to load a photo in the comments so I am posting a photo here. The pens in the image are the three that I use most often. The brown with the gold nib is one that I can change out the nibs on. I use my pen for drawing and not calligraphy, so I keep the nib to one that makes a thinner line. There are those that can make a thick line but I haven't used them much. All I can say about working with a dip pen is practice. It takes a light touch and dipping in the ink often to keep the line the same. I am by no means an expert. I have made many mistakes and am really just making it up as I go. My favorite ink is Winsor and Newton drawing ink. It mixes easy and has great color saturation. I just have an initial set but there are tons of colors. Anyway, I hope that seeing the pens help Ginny. Have a great week everyone! Thanks for taking a look and for your wonderful comments. The earth here in Delaware has started to really wake up and I am so glad! The leaves are popping out and early flowers have started to bloom. We even had our first thunderstorm this week. Spring is really here. Each year, over at The Diva, Laura posts an Earth Day challenge. This year is no different. I tried another zendala this year. 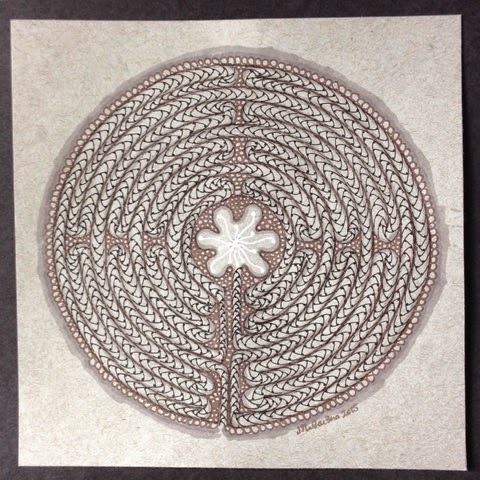 I adapted a mandala pattern from a book I have to make it more zentangle friendly (read opened some space for tangles) and gave it a go. I am so happy with how it turned out. For the "water" I used a dip pen and Winsor & Newton blue ink. I love how the Crest 2 pattern turned out. I want to fill a whole page with those awesome waves. Look for this in another design soon. I used my green Sakura pen for the Garlic Cloves and Diva's Dance. A little ink wash and some white ink fescu finished out the center. I hope that the weather is nice for you on this Earth Day. Thanks for stopping by and taking a look. As you may know, I take my artwork to a few shows during the year. Two years ago when I started to sell my Shrink Art Pendants, I just laid them on the table for people to see. I didn't have many so I didn't see the need for a display more complicated than that. They next year, I got a jewelry bar and hung them all up. This worked as I could put all of my necklaces out, but it required customers/ browsers to get up close and pull the necklaces out of the "pile" as it were. Some were interested enough to dig around, but I think that a few didn't feel like making the effort. Keeping the idea of a better display in mind, I have spent the "off season" thinking of something better. I looked at some online spots for a ready made display to buy but I couldn't find what I wanted. In December, we had new windows put in at our house and I decided not to put the stutters that were in the bathrooms back up. I got the idea that maybe I could recycle them into a display. I searched on line again and saw a lot of people have had this idea as well. 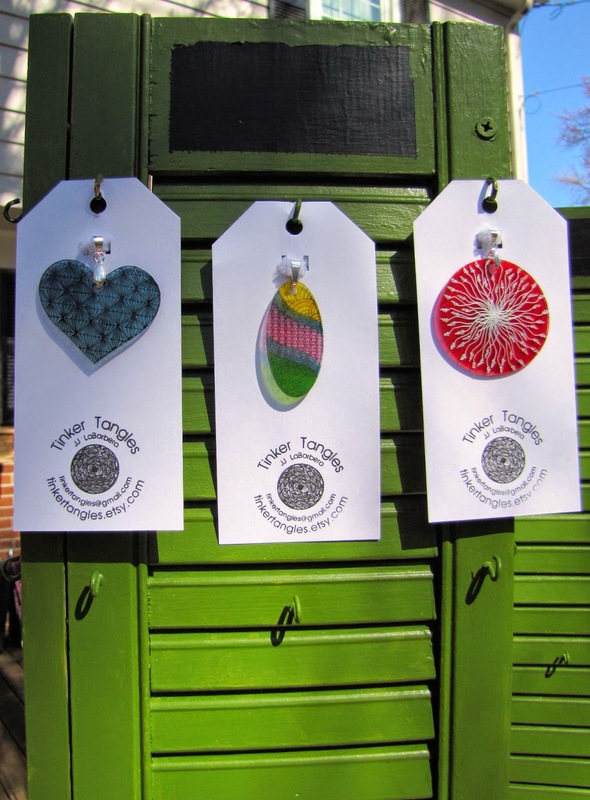 There are some really great ideas, not only for display at craft shows but for around the house. Again however, I really didn't see an idea that I liked. I thought that I might put the shutters on a chain and hang them from the sides of the tent, but I didn't want them to fall and hit someone. There are some great ideas to have the shutters stand up on a tabletop, but I have a lot of things to display and need to maximize my tables. In moving the shutters about, I set them in a square and thought "Hey! that's a good idea" but I needed the display accessible on all all sides. Then I thought about the lazy susan and knew that I had found an answer to my problem. I can make a display, secure it to a lazy susan base and then I would have a turning display. In the spirit of sharing, I thought that I would share with you how I made them. They are (mostly) completed and work like a dream. Hopefully they will make things better at shows. --Wood filler to fill in holes. 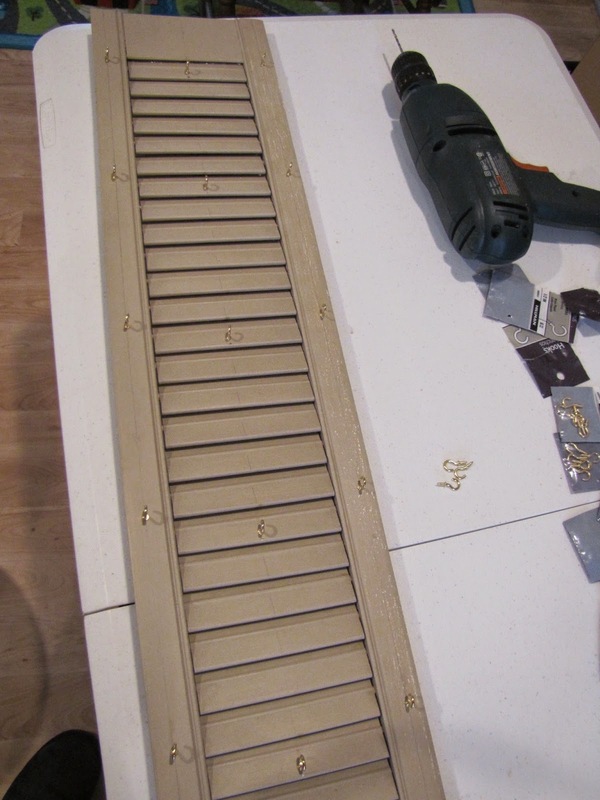 One set of shutters had been cut out spaces for the hinges so I wanted to fill those. --Cup hooks I used about 80-90. How many you need will depend on what you are hanging and how many you want per side. 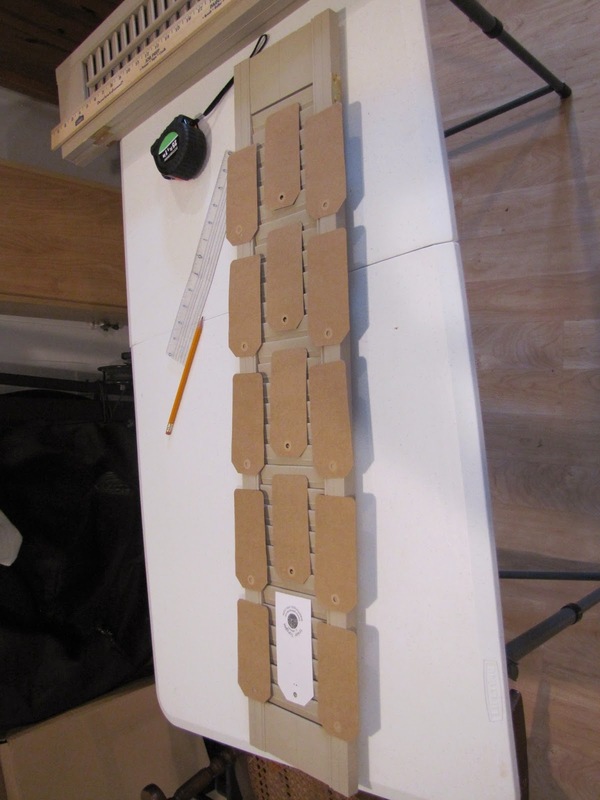 --Boards for the lazy susan base. I bought a MDF shelf and had the very nice man at Lowes cut it into 12" squares for me. I think that it was 12"x 48"x 3/4" If you're doing the math, not all the squares are equal but I just put the smaller on the bottom. If it bothers you, get 2 shelves, they are not expensive (about 4 dollars) and then you can have exact squares. --2 Lazy susan spinners and 16 screws. I had to order mine from amazon as there were only 12" round at my local store and that was too big. I ordered a 9" size. It didn't come with screws or directions. You can find directions online (how to assemble) and got 16 screws . I don't have the size but they can help you find what you need at the store. --Paint. I bought already mixed small jars at lowes and only used 2 (maybe a quarter of a quart) but I'm keeping them all for touch ups. --Chalkboard paint. I used this up at the top so I can write pricing on them as needed. No need to make a sign. So where to start? First you need your shutter and supplies. I had 2 sets of 4 shutters. As you can see in the photo. They were a yard (36") tall and about 7" wide on each individual shutter. 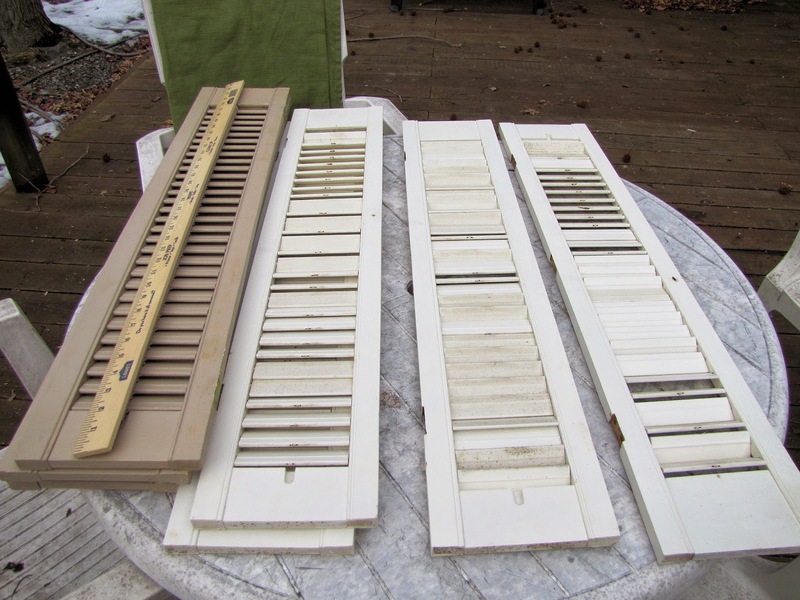 I took the hardware off the the shutters, the knobs and the hinges. I did consider leaving the hinges on them but I wanted a tighter square. I gave them a good cleaning and a light sanding to help prep them for painting. Next I made my list for the hardware store. I needed my paint, hooks for hanging, screws and stuff to make a couple of lazy susans. The first thing I did was put a small bead of hot glue on the shutters to keep them in position. I didn't want them to move on me while on display. One set was in bad shape, so glue was a necessary evil. Those white ones were a bit of a trial. I pulled off the bar that runs along the shutters. I opted to leave them on the brown. 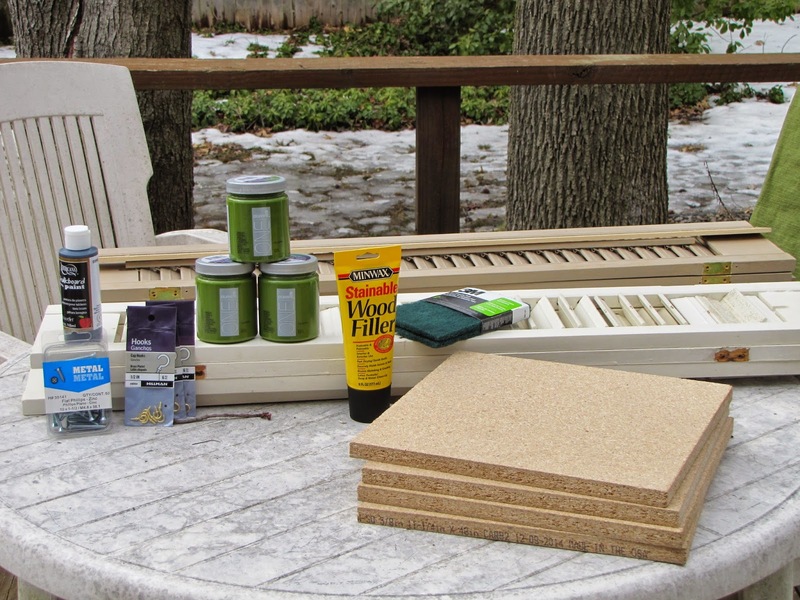 Once you get them glued, give them a good sanding and cleaning to prep them for painting. Next I positioned where the cup hooks needed to go. I opted to paint over my hooks. I bought brass ones but you can also find them in white. I don't guess that you have to paint them, but I wanted a solid color. I'm sure noone will care but me. To determine spacing, I found the center of the shutter, and laid the display card (a paper craft tag) at the top, left a little space and then marked the next one. I laid out all the cards so I could tell where they fit. After I got them marked in general, I took a straight edge and marked the spots so that they would be even on each side. I staggered the center a little. Once that was done, I drilled small holes so that the cup hooks could be attached. 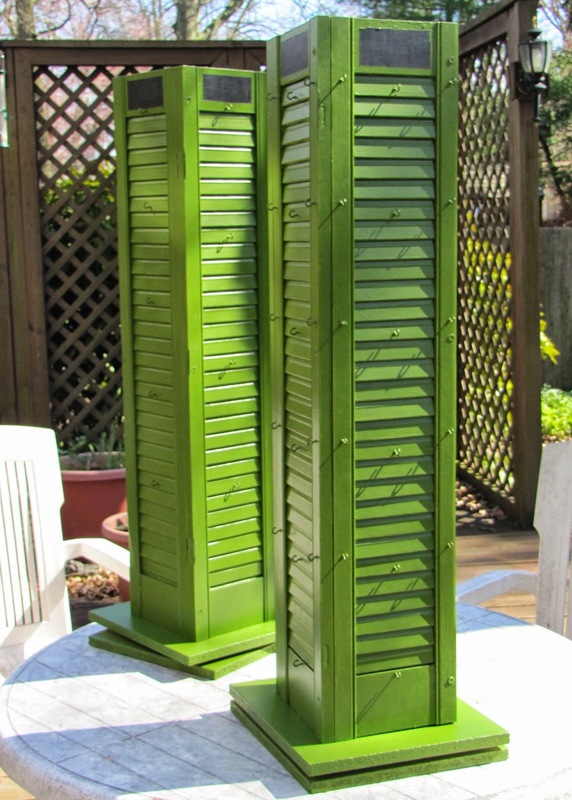 I then painted the shutters with several coats of paint. If you are good at spray painting and you can find the color you want in a spray, it might make it easier in painting. I am not a good spray painter though so I just used a small brush. After the paint dried, my dear husband helped screw the shutters together. This is a 2 person job to be sure. We used 3 of the 1 1/2" screws on each side. One in the center and one at each end. Screwing into the paint didn't cause any problems for the painting I had already done and I just painted the screw heads over. The final configuration looks like this from above. One set didn't make a perfect square but no matter, when they stand up, no one can tell. Next came the lazy susan bases. I will be honest here, it is a bit of a pain. But, there are directions and youtube videos galore to help you out. I highly recommend watching/reading up before starting this. I wanted a square base but I am sure that a round would be fine should you have one already made. For the base, I first screwed the top of the lazy susan to the bottom of the shutters. 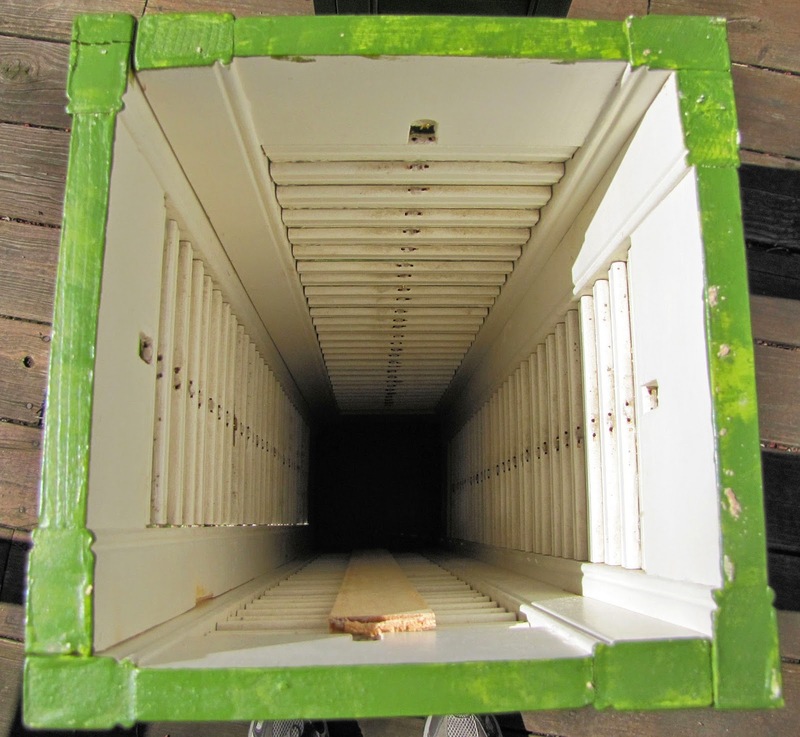 This way the base is directly attached to the shutters. Don't want an over zealous kid spinning them and the whole thing go flying. Then the lazy susan hardware is attached. We did this by drilling 4 bid holes in the bottom square, screwing the bottom of the hardware onto the bottom square, then turning it over on to the top and using the holes, screwing the top of the hardware onto the top square. That is confusing I know. Watch the videos and don't be afraid to walk away when you want to smash it to bits. There may be an easier way to to this. Build or buy your lazy susan and then attach the base to the top with L brackets at the corners. It will all depend on how you feel about the assembly of the lazy susan and if you mind the L brackets showing. Lastly, I marked off sections at the top of each shutter and painted them with chalkboard paint. I don't change my prices much but I am good at forgetting a sign at home, so this way the sign is attached and I just need to throw a chalk pencil in my show box. In the end you get this! I made 2 units. One is for hanging pendants and the other for ornaments. For the pendants I can get as many as 16 on each side. I will have plenty of space now. The other is for ornaments and will only get 4 or 5 per side. Being porcelain, I didn't want to crowd them. I think that I will have to add a loop at the top of my pendant cards. A small one out of ribbon will do the trick I think. The cup hooks curl up close and the hole in the paper just a little too deep on to the card to hang without bending the paper. Not a problem though. I thought that might be an issue so I picked up some to have just incase. Are these directions clear? Helpful? I hope so. I would love to know if you make some. Please share a photo or two! 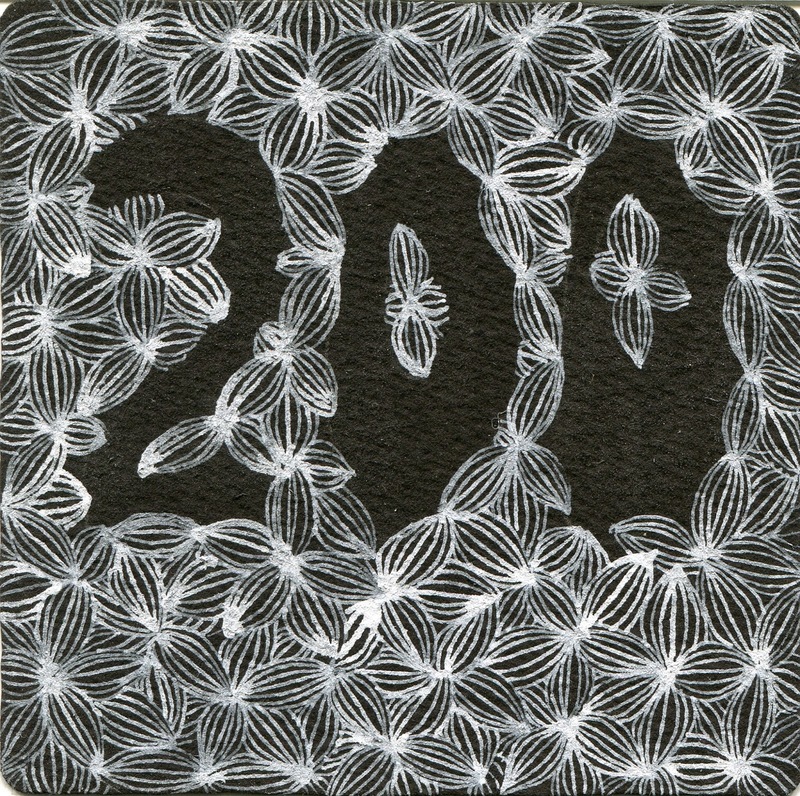 Over at The Diva, Laura has posted her 200th challenge. Quite an accomplishment I must say. As the challenge this week, we are to make a monotangle of our go to tangle. My go to tangle changes from time to time but currently it is Garlic Flower (or at least that is what I think that it is called.) I have tried to locate the blog where it originated but I have having some trouble finding it. If you know, please link to it in your comment so that I can edit this post and add credit where it is due. My most hearty congratulations to Laura on her wonderful achievement. You are a constant source of inspiration both in your art abilities and as a Mom. I am looking forward to 200 more! 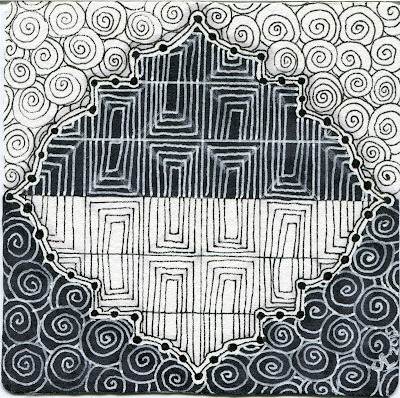 I made this on one of the black zentangle tiles, using a thinned Speedball white ink and a dip pen. I want to explore negative space more so I thought I'd use this challenge as a try. I hope you like it.